Can I interest you in a free half-ounce of silver? I can help you get that if you're looking to diversify into precious metals. If you want to just get to it, scroll down to the end of this post where I explain how. If you would like to consider some thoughts on why you should own precious metals, read through this post to the end. There are many kinds of insurance that a person can buy: health, life, auto, home, etc. These things are meant to financially cover injuries to those things, to "make whole" the damaged thing or party and restore them to the condition they were in prior to the covered incident. I'm not talking about stuff like FDIC insurance, which guarantees the total of your deposit in a bank (up to a certain limit, but that's a topic for another day), or insurance against theft of your money. 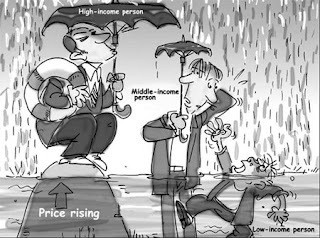 I'm talking about insurance on the value of your money, its purchasing power. The purchasing power of your money is separate from the sum total of it, and in this day and age it needs protecting, too. Inflation is simply an increasing supply of money chasing a relatively static or decreasing supply of goods and services. Essentially, if today there are X dollars, and tomorrow the government decrees that there will now be X+1 dollars, but tomorrow there will still only be as many widgets available to spend dollars on as there are today, then tomorrow people who have access to that +1 can offer more dollars for the available widgets than people who do not have access to the +1. The supplier of widgets will of course accept the +1 by raising his asking price to match, so if you didn't have access to it, no widgets for you. Deflation is the opposite of this. Who has access to the +1? For the most part, it's big banks, which receive the "money" created out of thin air by the Federal Reserve (in other countries, from their central banks). From there it moves out into the economy via a list of connected parties titled, "Not You." Those people and entities then have the newly created "money" at their disposal as they buy and sell in the same market place you participate in, which for most of us is via the wages that we earn from our labor. Sometimes your wages will do a decent job of keeping up with inflation, but most of the time they'll not. Other times, the supply of goods and services can increase to match the increased money supply, but if there's extended periods of high unemployment, it won't be happening. Generally, inflation will be the case, because central banks actively create it, purposefully avoiding deflation, as a matter of policy! The thing that can get hit the hardest, however, is the purchasing power of your savings: the money you set aside for future use. The resource that you traded some of the finite time of your life for could be dropping in value and become worth less than it was on the day that you earned it through no fault of your own! Isn't that nice? You work hard, you save some of what you've earned to create some security for yourself, and then along comes .gov, printing money to cover its own stupid moves, thereby devaluing your savings, your labor and your time on this earth. What can an individual do about this? There are a couple different things you can do to mitigate this very real problem, and the topic of this post is one of them: precious metals. These are two silver 1oz rounds that I recently purchased from Money Metals Exchange. They've joined the various pieces of silver I already owned, and will be joined by pieces that I will be buying in the future. I also hold a little bit of copper and gold, too. What can silver (or other precious metals: gold, platinum, copper, etc.) do for you? Picture a seesaw. On one end is your savings in fiat currency (such as dollars). On the other end are the things you can buy with your dollars. At the moment you earn your dollars, the seesaw is flat, level from the end your dollars are on to the end the things you can buy are on. If you spend your newly-earned dollars immediately, the exchange of value should be roughly equal. 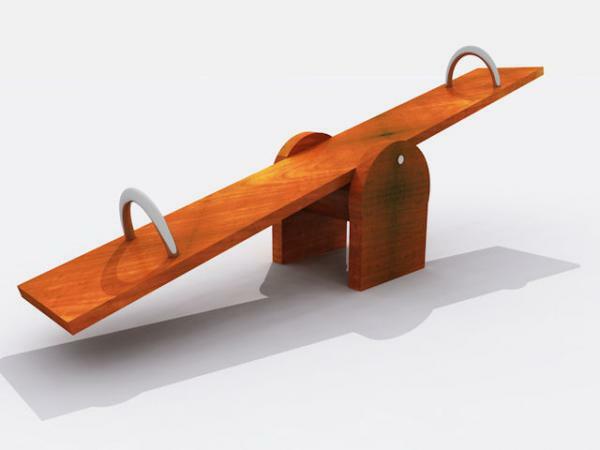 But if you set some of your dollars aside for a rainy day, inflation causes the end of the seesaw they're on to dip. If instead of setting some of your dollars themselves aside (such as in a savings account at your bank) you were to exchange them for some silver, your silver joins your dollars and the things you can buy on the seesaw, and the arrangement of them changes: your dollars remain on one end of the seesaw, but your silver moves to the opposite end, and the things you can buy with your dollars moves toward the center. The value of precious metals in dollars moves up and down over time in response to various factors, so at times your precious metals holdings can be worth more than what you originally paid for them, and at other times less. Your dollars, in terms of inflation and deflation relative to the goods and services available to exchange them for, can do the same thing. The key difference though is that while .gov can just create more dollars out of thin air, and often does, no one can do that with precious metals: a finite quantity of them exists in the universe, and no bureaucrat anywhere, ever, can simply decree that there will be more. Thus, as .gov debases the value of your saved dollars by bringing more of them into existence from nothing, it then takes more dollars to equal a unit of silver, so any silver that you own becomes valued in a higher number of dollars. Your access to the things you need and want, goods and services, thus becomes more stable - it sits closer to the center of the seesaw, which remains level between its ends - because your savings was placed into something with a value that frequently changes inverse to the value of dollars. When inflation is increasing and your dollars are becoming worth less relative to the goods you need to buy, but your savings in metals have increased in value, you can exchange them back into currency and buy the things you need, possibly at the inflation-adjusted value they used to have when you originally earned your dollars. That is, you preserved the purchasing power of your money in the past, helping to keep it at the value it had when you earned it then for your use now, or even further into the future. That is how precious metals can be a sort of insurance on the purchasing power of your money. You could make money on metals if a speculative bubble develops (at which point it might be a good idea to step back into fiat currency for a time; your mileage may vary), but for the most part precious metals' beneficial use is as a means of protecting the value of the resources you earned by exchanging some of your finite time on earth for them, time that you can never recover. There are several ways you can participate in the ownership of precious metals, but the method I'm writing about here is physical possession of your savings in metals. That picture above of those one-ounce rounds, those are some of my actual rounds in my hand. I bought them from Money Metals Exchange (MMX). You can, too. And this is where that free half-ounce of silver comes in. Money Metals Exchange has a referral program. When existing customers of MMX send new buyers their way (per household), MMX offers free silver to the client who made the referral and to the new customer: silver for you, and silver for me (that's whether you buy silver or some other product). When you place your order, you must inform Money Metals Exchange that I sent you. If you do not complete this step, you will receive the metals you ordered, but you will not get that free half-ounce round of silver. To do this, at the time you place your order, inform MMX that Paul Zimmerman from Dixie, Washington sent you (you'll need to specify the town I live in because there are several Paul Zimmermans out there...). You may be able to do this online at the same time that you place your order, but you can also do it by sending them an email, or by calling MMX at 1-800-800-1865 immediately after your order is placed (be sure to reference your order number!). If your order ships before you've let them know I sent you, you're not going to get that free silver, so be sure to do it! If you've been thinking about diversifying into metals for added financial security and peace of mind, or if you already have some but are not already an MMX customer, take this offer! I'm not an MMX employee, just a customer. I'm trying to help you and me at the same time by posting this offer. As MMX points out on their website, few Americans own even a single ounce of gold or silver, but through destructive monetary policy our government is screwing all of us. Every gram of precious metal that you can add to your holdings will benefit you, and it's hard to beat free!